No one can know for sure what the incoming Trump administration will do, but President-elect Donald Trump has repeatedly criticized and threatened the media in the United States. In lieu of attempting the impossible and predicting the future, we’ve gathered all of Trump’s stated positions on free speech and freedom of the press. If you are aware of any additional statements that we have not included, please email kate@eff.org with a link to your source material, and we will consider it for inclusion. While running for president, Trump made his general feelings about the press very clear. He has called the media “dishonest” and described reporters as “scum,” “sleaze,” and “horrible people.” At a rally last February, he famously said, "I'm going to open up our libel laws so when they write purposely negative and horrible and false articles, we can sue them and win lots of money." Trump has repeatedly denied the media access. During his campaign, he pulled out of two debates because he reportedly didn’t like the way he was treated by Fox News and its reporter, Megyn Kelly. He also pulled the credentials of several national media outlets, including the Washington Post, for ideological disagreements, and, in the Post’s case, for an arguably inaccurate headline. The Post’s Executive Editor Marty Baron called the move, “nothing less than a repudiation of a free and independent press.” Trump’s campaign also blacklisted reporters from Gawker, BuzzFeed, Foreign Policy, Politico, Fusion, Univision, Mother Jones, the New Hampshire Union Leader, the Des Moines Register, the Daily Beast and Huffington Post. That left reporters having “to try to walk into public events with the general crowd rather than being escorted into the press section.” However, when one Politico reporter tried to report from the general audience section at a Trump rally instead of the press pen, Trump’s staff kicked him out and then denied him credentials to a later campaign event. Since winning the election, the incoming administration has broken from the practices of past incoming presidents in ways that could impact how the press reports on and the public learns about its activities. For example, Trump broke from “decades of tradition” by not traveling with a press pool during his campaign and continued to do so even after the election. This meant that the public often learned about Trump’s conversations with leaders of foreign countries from the countries themselves, rather than the press. And Trump’s incoming Chief of Staff, Reince Priebus, implied in an interview last week that the new administration may do away with daily press briefings in the White House. This blog post is part of a campaign asking the tech community to defend users and digital rights. Have we missed something? 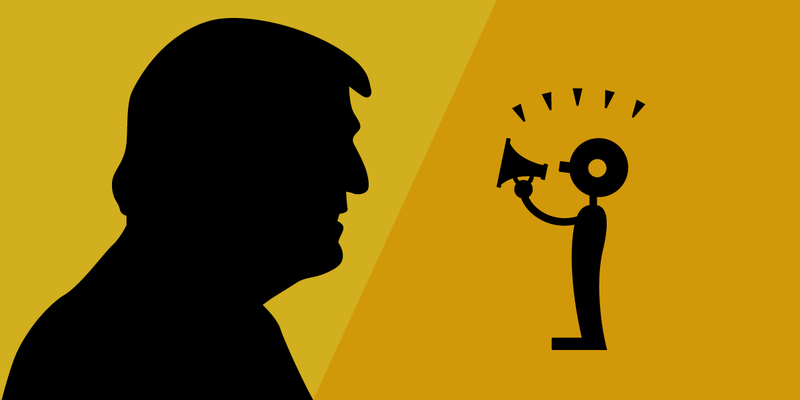 Send us any additional statements from Trump and his advisors about free speech by emailing kate@eff.org.